It takes five hours to make the — relatively — straight shot from Spokane on home. If you don’t stop anywhere. I’ve driven this stretch so many times I’m pretty sure Kestrel and I could do it in our sleep. It’s not like we’d be missing a whole lot, either, at least for the first three hours. It doesn’t take more than about a dozen miles headed west from Spokane before you’re out of the pine forest and into the high desert, alternating between irritated croplands and plains of sagebrush. On the bright side, you do start getting glimpses of The Mountain (aka Mt. Rainier, aka how I know I’m really almost home) from as far away as Ritzville, about sixty miles southwest of Spokane, given decent weather conditions, which include clear weather on both sides of the Cascades. I had decent conditions two weeks ago today, and here’s the photographic proof. Mt. Rainier from just west of Ritzville, Washington, a distance of roughly 160 miles as the crow flies. After I passed Ellensburg, and I-90 turned northwest again towards Snoqualmie Pass, I got this nice shot of what I think might be Mt. Baker as well, although I wouldn’t swear to it. The shape’s right, anyway. What I think is Mt. Baker, from I-90 west of Ellensburg, Washington. And that was the last photo I took on this trip. I climbed up over Snoqualmie Pass and got stuck in construction traffic (they’re redoing the interstate over the pass, which involves taking things down to one lane all the time and closing the highway altogether at night so they can blast rocks), but I still made it home by about 2:30. My condo hadn’t burned down and the cats were still alive (and shot out the back door like furry little cannons when I opened it), and, while this trip was too short, it was good for my soul. And I want to go right back out again! And so on towards home. From Sheridan — well, actually from Twin Bridges, the next little town down the road — there were two ways to go. One north, which I hadn’t driven before but which led to I-90, which I’ve driven at least a couple dozen times, and one southwest towards I-15, that stretch of which I’d never driven before. Even though it was about twenty miles further, guess which way I took? And I’m glad I did. The first bit was very pretty, through sparsely populated ranch land ringed with mountains and down into the town of Dillon on I-15. I’ve only been to Dillon once before. It was the first place on my Long Trip in which I couldn’t find a place to stay (due to it being Labor Day and the annual rodeo). From Dillon I headed north on I-15, and, less than twenty miles down the road, I happened to glance over to the right and saw a bald eagle perched on one of the posts holding up the wire fence running alongside the road. Fully mature, white head and all, he had to be two feet tall, I swear. Too bad I was going 70 mph on a freeway — I’d have tried to take a picture of him. He was amazing. Deer Lodge Pass over the Continental Divide south of Butte (where I-15 and I-90 cross) is much more gradual and less steep than Homestake Pass due west of Butte. But because of that I think I was climbing pretty much all the way from Dillon to the pass. At any rate, once I hit I-90 I was on familiar territory and pretty much ready to head home. I stopped for iced tea in Deer Lodge (the town, not the pass, which is about forty-five minutes from Butte (the highway signs say west, but the road runs almost due north-south at that point). I stopped for lunch and more gas in Missoula. And I crossed over Lookout Pass into Idaho and the Pacific Time Zone about the middle of the afternoon, aiming for Spokane. I won’t bore you with the hunt I had to make for a motel room in Spokane. Suffice to say that I think I’ve found a new reasonably-priced convenient place to stay there on my way to wherever, which is a good thing as the one I was used to using had upped its price out of reason because of Hoopfest (I’m assuming) that weekend. Only one photo today, taken along I-90 between Missoula and Lookout Pass, probably closer to Lookout Pass. I was trying to take a photo of the rain falling ahead of me, which actually turned out to be mostly virga (that is, not hitting the ground). Stormy weather along I-90 in western Montana. And that was the penultimate day of my trip, two weeks ago today. Rain, rain go away, come again some other day. Preferably after I get home, but oh, well. Yes, I woke up to more rain two weeks ago today. I drove back into the park, anyway, of course (it’s about thirty miles from West Yellowstone to Old Faithful), and parked Kestrel (my car) near the lodge. Still feeling optimistic about the weather at this point, I packed up my daypack with all the necessities for a day out in the geyser basin, including, but not limited to, my Kindle, my journal, and my cross-stitch (some geysers must be waited for, sometimes for up to three or four hours). Fortunately, my daypack is waterproof and I have a good raincoat. My first stop was in the visitor center, to check the eruption predictions. Old Faithful itself goes off often enough that one can often catch it in passing while headed somewhere else, but Riverside only goes off every six hours or so, Castle every nine to eleven hours, and the Grand, that pinnacle of predictible geysers, erupts about every seven to eight hours, so if I wanted to see them, I needed to know when to go sit and wait for them. Eruption predictions are never on the minute. Grand, for instance, has a three-hour window, which means that it’s most likely to go off up to an hour and a half on either side of the prediction time. Riverside and Castle were predicted to have morning eruptions, and the Grand wasn’t due to go off till late afternoon. Anyway. About the time I left the visitor center, the sky opened up. Not quite raining in sheets, but in the five minutes it took me to walk from the visitor center to the Old Faithful Inn, I was fairly drenched where my raincoat didn’t cover me, and the visor of my hood was dripping. Still, as I peered through the murk over towards Old Faithful, I did see Lion Geyser erupting in the distance. But I really didn’t want to get any wetter, so I used the zoom on my camera to get this shot. The sign says Old Faithful. The actual geyser in the distance is Lion. And instead of sitting out in the rain waiting for things to erupt, I went into the Inn and found myself a cozy spot and caught my journal up after several days of ignoring it. Not exactly what I’d had in mind, but there are much worse places to be stranded. The 85-foot-tall, 500-ton (according to Wikipedia, at least), four-sided fireplace in the Old Faithful Inn, with its hand-forged clock. An hour or so later the rain let up and I finally went out into the geyser basin. I walked out as far as Castle Geyser, which had apparently gone off during the rainstorm but was still bellowing (and I mean bellowing — the sound is pretty impressive) steam. Castle Geyser, bellowing steam in the distance. I turned right and headed across the bridge towards Sawmill, which was churning away as usual. I know the “real” geyser gazers don’t think much of Sawmill because it robs energy and water from other, rarer geysers like Tardy and Penta, but I like Sawmill, for its chugging sound (hence the name) and simply because it looks like it’s thoroughly enjoying itself. Sawmill Geyser on the left, and what can only be Tardy Geyser on the right, unless I’m mistaken, which is altogether possible. Most geysers do. I can’t help anthropomorphizing them that way. I just can’t. I’ve never met a more cheerful geologic phenomenon than a geyser, and that’s just the way it is. A view of Geyser Hill from the old road. I strolled around Geyser Hill, past Giantess (one of the biggest geysers in the world — and also one that I’ll probably never get to see because it erupts so seldom) and Beehive, which is not an officially-predicted geyser, but can be caught occasionally because it’s got what’s called an indicator, which is a small geyser off to its side that often starts erupting just before Beehive itself does. I’d missed it this morning, but here’s what it looks like from 2008, in much better weather, when I didn’t miss it. Beehive Geyser, 2008, from the viewpoint across the river. Note the tiny people on the boardwalk next to it. Then it started raining again, and it was past lunchtime, so I went to what’s affectionately known as the Lower Ham (Hamilton, although it’s no longer owned by the family) store, and ate lunch at the counter there. That lunch counter/soda fountain has been there a long time, by local standards. The store itself was first built in 1897, and Charley, who was still Chuck at that point, ate his last meal in 1959 there before he inadvertently time-traveled back to 1877 in Repeating History. It’s also where James first went looking for his son just after Chuck disappeared and met Jo in Finding Home. An important place, the Lower Ham store. This isn’t my photo, but I wanted you to see what it looks like. My only eruption of Old Faithful on this trip, taken from the shelter of the Lodge porch. A blue bird (not sure of exact species — ETA, my birder friend Katrina says it’s a mountain bluebird) which was hanging around Old Faithful just before the eruption. The rain started again a few minutes before the geyser went off. It took the rain a while to let back up again, alas, although I did catch what turned out to be my only view of Old Faithful from where I’d walked back to the Lodge (as opposed to the Inn), and by the time it did, it was getting close to four in the afternoon, Grand’s predicted time. Of course, given the window, it could have already gone off, but I didn’t have anything to lose except the time and a little shoe leather, so I headed back out one more time. Except for the rain, this was a pretty normal geyser basin day for me. Out and back and out and back, watch this geyser and that, have a thoroughly good time. Anyway, when I got back out to the Grand, there were still a fair number of people sitting and waiting. My spirits rose. And, lo and behold, less than ten minutes after I sat down, guess what happened?! Grand’s pool, which had already been overflowing, started generating little waves, Turban (a kinda sorta indicator) went off, and away Grand went! I think that’s the shortest amount of time I’ve ever waited for the Grand. This is my alltime favorite photo of the Grand, taken in 1999 during the eruption that inspired Repeating History. And it was. Grand, that is. Just one burst, but it was a good long one, and that was enough to make my day. Make my trip, actually. Especially since I always think of the Grand as Charley’s geyser. It was a crucial half (the other half being an earthquake I’ll tell you about tomorrow) of the phenomenon that sent Chuck back in time to become Charley in Repeating History, and it also caused Charley’s son Will and — okay, this may get confusing — Will’s five-year-old grandson Chuck (yes, that Chuck) to witness something in “Homesick” that changed their lives forever. The rain didn’t start back up yet again until I was back in my car and headed back to West Yellowstone an hour or so later, either, and that was a good thing, too. No sleep, and more mountains! Well, that was the only night I camped on this trip. For some reason I could not get comfortable in my sleeping bag, and I finally gave up about four in the morning. So I pulled out my Kindle and read till it got light at about 5:30, packed up, and headed out. Not very far at first — the Sunrise campground sits at the very top of the long, steep drop to Bear Lake, and a very nice viewpoint/visitor center, which was unlocked even at that gawdawful hour of the day (much to my pleasure, as the campground only had pit toilets and no running water), is practically next door to it. So I got cleaned up and then sat and watched the sun rise over Bear Lake. It was fairly spectacular. Sunrise at Bear Lake, Utah. I decided I deserved breakfast out after that, and after descending 2000 feet (7900 to 5900) to Bear Lake and the small town of Garden City, I started looking for somewhere that might feed me one. Nothing, and I mean nothing, was open in Garden City at six a.m., though, so I went on, heading north along the shore of Bear Lake. Eventually I crossed the state line back into Idaho, and found the small town of Montpelier, which was just waking up for the day. The lady at the gas station where I filled the tank for the fourth time on the trip told me the truck stop just north of town was about the only place to go to get breakfast (I did mention that Montpelier is a small town, right?). So I went to find the truck stop. It turned out to be a nice place, as such things go, and the waitress very helpfully warned me that I only wanted one pancake, not a short stack. Wow, was she right. That pancake was about twelve inches around and at least half an inch thick. It was good, though, especially with Bear Lake raspberry syrup (the berries are a local specialty). I ate a bit more than half of it before I gave up. I headed north and east on U.S. 89, the same highway that I took all the way to Yellowstone. Up and over a pass and into Wyoming, where I noticed that I was not as alert at the wheel as I could be, so I stopped in a forest service campground, let my seat back all the way, grabbed my pillow and afghan, and crashed for a couple of hours. Much refreshed, I arrived in the town of Afton an hour or so later, where I got stuck in a bathroom line with a bunch of French-speaking bus tourists, and saw what is purportedly the world’s largest antler arch across the main drag in town. I did not get a photo of it, but if you click here you can get a look at it. My goal for the day was the ski resort of Jackson Hole (no, not Jackson’s Whole — that would be the wrong Nexus, thank goodness), where I was going to spend tonight, and Grand Teton National Park, where I would spend the rest of the day. I’d spent about half an hour on my cell phone last night in the campground — I don’t know why I’m still astonished that I can talk on the phone in places that remote, but I am — making sure I had a place to sleep tonight at the hostel in Teton Village (at the base of the ski resort) and for the next two nights (they didn’t have space after that — last minute trip planning can be a bear) at the hostel in West Yellowstone. I hadn’t spent any time to speak of in the Tetons since I was a kid. In 1999 on my Long Trip (see my book Cross-Country: Adventures Alone Across America and Back) I’d spent an evening on a dinner cruise on Jackson Lake with some friends, and in 2008 my friend Mary and I passed through, stopping for a few photos, on our way from Yellowstone to Denver for WorldCon, but that was pretty much the extent of it. In all the rest of my jaunts to Yellowstone, I hadn’t bothered to come south even that far. So I wanted to spend a little time here, at least. The Teton Mountains, Grand Teton (13,776 feet — almost as tall as Mt. Rainier) front and center. The Tetons are spectacular, I’ll give them that, but they strike me as a bit — aloof. It’s hard to get out in them without doing a lot more hiking than I’m capable of. I stopped along the roadside to take pictures and to look at wildflowers (which were everywhere), and then at the visitor center at Moose, which was fun. Then I drove out to Jenny Lake and decided on a whim to take a boat ride across the lake to a trailhead that led to a waterfall. The Moose at Moose — no real meece, alas, not on this trip. Scarlet gilia, which I’ve always thought of as a California wildflower before. Another view of the Tetons. The boat ride was fun. It was also a great way to cool off from the 80+ degree temperatures. And the hike to the waterfall, albeit with a boatload of my new close friends, was good, too. So that was worth it. From the boat on Jenny Lake. Hidden Falls, approximately 100 feet tall. Waiting for the boat to go back across Jenny Lake. After the ride back, though, it was getting late, and I took what was supposed to be a short cut but turned out to be a goat trail back to Teton Village. And I ended my day by scaring the bejeebies out of myself. There was this gondola, you see. It was free in the evenings. 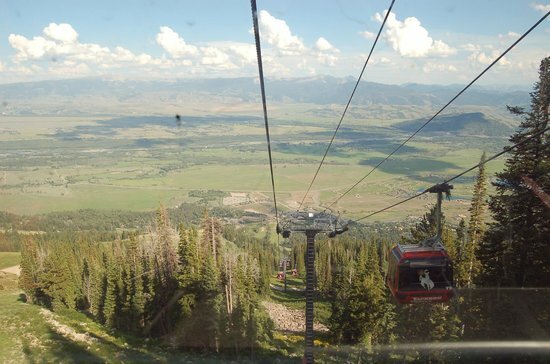 I thought it would be like the gondola at Crystal Mountain here in Washington state, which is a pleasant little ride. This was not a pleasant little ride. It turned out to be about three times as long and three times as steep, and by the time I got to the top, I was a gibbering idiot (I don’t do manmade heights, at least not ones like these). If you want to see what the view from the top looks like, click here. I left my camera in the car. I almost couldn’t make myself ride it back down again, but a group with a baby(!) got in the gondola with me, and that happy little baby was a great distraction. Thank goodness. I’m not sure I’d have made it down sane without him! And that was more than enough for one day. Southern Idaho, as I’ve said before, is a desert except where it’s irrigated. I was traveling across the path taken by the Yellowstone hotspot in ancient times — if you look at a satellite view of the region, you’ll see this sort of U-shaped giant-sized ditch in the land where, over the last few million years, the hotspot made its way from northeastern Nevada/southeastern Oregon, across Idaho, and up to northwestern Wyoming, erupting periodically along the way. What it left behind was a vast trough full of volcanic rocks of various kinds. Which isn’t necessarily a bad thing. With enough weathering and the addition of some water, it can be transformed into hellaciously fertile farmland. Think about where all those famous Idaho potatoes come from. Although Washington actually grows more potatoes than Idaho does these days — but they do it on the same types of volcanic soil. Different eruptions, though. Anyway. I headed southeast on I-84 to the Utah state line. Once upon a time, I drove this stretch of highway in January, moving from Eugene, Oregon, to Fort Collins, Colorado, and the landscape didn’t actually look all that different from today except for the skim of dusty white snow swirling across the highway back then. This is true high desert — don’t let the signs for Salt Lake City fool you. I left the highway at the exit labeled #26 after crossing the state line, where the sign said, rather ominously, “NO SERVICES.” But that’s where the directions for the Golden Spike National Historic Site said I was to get off, and it’s not the most isolated place on the planet I’ve ever been (see Stanley, Idaho, night before last, which doesn’t take that pride of place, either). The other sign at that exit said, rather mysteriously, “ATK.” I had no idea what ATK was, but maybe I’d get to find out. After coming over a rise and crossing abruptly from desert to irritated farmland, then going around a few miles worth of bends in the road, I found out what ATK is. Apparently it’s where they build rockets for NASA and missiles for the Defense Department. And they’re proud of it, because out in front of this big cluster of 1960s-era-looking buildings out in the middle of absolutely nowhere was something I’ll call a sculpture garden for lack of a better term. ATK — a real surprise out in the Utah desert. Bemused, I parked the car and took a gander. Each one was mounted on a big metal pole, and each had its own label telling what it was. A space shuttle booster rocket. After goggling for a bit in the windy heat (it was well into the 90s that day), I got back in the car, fired up the AC again, and headed for a much older form of transportation. Golden Spike National Historic Site, like Pompey’s Pillar (a Lewis and Clark site I visited a couple of years ago) has always sort of been on my nonexistent bucket list. It’s where the Union Pacific and the Central Pacific met in 1869, to form the first transcontinental railroad in the U.S. The event was celebrated by a bunch of dignitaries coming to this place out in the middle of the Utah desert just north of the Great Salt Lake (you can see the salt flats from a viewpoint at the site) to hammer a golden spike into the last railroad tie and ceremonially join the two railroads together. Looking out towards the Bonneville Salt Flats and the Great Salt Lake from a viewpoint at the Golden Spike National Historic Site. It’s an interesting place historically, and it’s also cool because the NPS keeps two replica steam locomotives on site, and runs one or the other of them daily at 1 pm for a short distance. Steam locomotive at Golden Spike National Historic Site. The engineer’s cubby in the steam locomotive. Part of the authentic reproduction paint job. This is a portrait of Johnny Appleseed. I ate a picnic lunch while waiting, after having been told by the ranger that I couldn’t bring my food indoors into the AC because they had a small mouse problem (I’m pretty sure it was the mice that were small, not the problem). Then I got to see cutting edge transportation from the 19th century, smokestack, whistle (loud!) and all. Which was pretty damned cool (unlike the weather). After the demonstration, I headed east again on a backroad that thought it was a roller coaster, back down, down, down to cross I-84 again and on to the city of Logan, Utah. I hadn’t checked email in a while, and I needed groceries and gas. What ended up happening is that I got really lost trying to find the library (for email — my netbook no longer being wifi capable), but I finally made it out of town after a stop at a ranger station to make sure I was on the right road (there wasn’t a sign to be seen), where the ranger gave me a wonderful pamphlet about Logan Canyon, which was where I was headed. And that’s how I ended up camping at Sunrise Campground in Utah, overlooking Bear Lake, up in the aspens where it was lovely and cool and the wildflowers were everywhere. Oh, and I sold a copy of Repeating History to a couple I struck up a conversation with at the campground. Which is the first time that’s happened. I’m glad I took the print copies with me. The Sawtooth Mountains early in the morning weren’t quite what they’d been the evening before, mostly because I was looking at them from the wrong direction. Still beautiful, however. I ate breakfast on the same porch I’d sat on the previous evening, then packed up and headed back south again. Sawtooth Mountains near Stanley, Idaho. Stanley, Idaho, is a few miles to the right of the tip of two highways forming a sharp V shape, and a large part of the righthand section, down which I aimed to drive today, is within the Sawtooth National Recreation Area, a place I suspect would have been a national park had the locals not been seriously agin’ the idea (after having watched what happened when David Rockefeller bought up most of Jackson Hole and given it to the feds for a national park). As it is, a large chunk of the Sawtooth NRA is designated as wilderness, and the rest is much less regulated. And beautiful. The Sawtooths are amazing, just as jagged as their namesake and still partially snow-covered even in late June. My first stop was at Redfish Lake, the name (after the sockeye salmon which used to spawn here) of which I remembered from a trip my parents and I made here when I was somewhere between eight and ten. Redfish Lake, Sawtooth National Recreation Area, Idaho. Sawtooth Mountains above Redfish Lake. Clear water at Redfish Lake. I love this texture. When I last spoke with my mother, her primary memories of the place involved mosquitoes the size of small helicopters, but even though I spent some time walking along the lakeshore and out onto a pier, I didn’t run across a single one. I did, however, see some lovely wildflowers. They’re penstemons, and I can’t get any more specific than that, alas. They’re much more electric blue than in the photo. Some things are just too weird to believe without a photo — just north of Galena Summit. After a couple of hours, I headed south, down the valley, where the mountains weren’t the only view, and up over Galena Summit. The view from Galena Summit. It was a terrific place to admire the view, and only a few miles down the road was a lodge where I ate a delicious lamb burger for lunch. After that, it was on down to Ketchum and Sun Valley, the world-famous ski area and home of the U.S.’s first chairlift, built back in the 1930s. Unfortunately, Sun Valley looks like someone took a chunk of Southern California and dropped it into Idaho. So about all I did was go find the Ernest Hemingway Memorial (not that I’m a huge Hemingway fan, but I was an English major), and got back out on the road. The Ernest Hemingway Memorial, Sun Valley, Idaho. I left the mountains behind not long after that, and had to make a decision, whether to go to Craters of the Moon National Monument, which I’ve visited twice before, or to head down into Utah to visit the Golden Spike National Historic Site, which I hadn’t. Golden Spike won out. But that was too far for one day, so once I reached I-84 again I started looking for a motel without much success. One of the few disadvantages of not deciding where you’re going until the last minute is that you can’t make reservations. Most of the time it’s worth it. But this time I was beginning to wonder what the heck I was going to do if I didn’t find something. At last I saw a sign off the freeway in the town of Heyburn and went to check it out. It looked reasonable enough, and the price was right, but most of the rooms were full of road construction workers, and while that didn’t bother me, the manager went to great lengths to reassure me that he and his family lived on the premises, and that the construction workers were harmless. It was all rather amusing. And that was the end of the third day! Two weeks ago today I headed out for parts unknown. Well, at least some parts, and at least some of them were unknown to me. And I didn’t know I was going anywhere until four days before I left. Things happen that way sometimes, especially when my feet get itchy. I have raced across Idaho on my way to Yellowstone a fair number of times in the last fifteen years, straight across the narrowest part just south of Canada on I-90, less than 80 miles between Washington state and Montana. So this time I decided to take the long way around, and explore Idaho, part of Wyoming, and even a little bit of Utah along the way. But first I had to get across Washington. Normally that’s another I-90 buzz across to Spokane, a five hour drive to the Idaho state line, but I wanted to do things a little differently. This time I went south and east, skirting the eastern edge of Mt. Rainier National Park and heading over Chinook Pass on U.S. 410. The pass was clear and dry, but it’s obvious that it’s only been open a few weeks judging from the amount of snow still lying about on the mountainsides. I left that behind quickly, though, and, with one stop at a fruit stand for a bag full of Rainier (of course) cherries the size of small plums, I was through Yakima and on I-82 to I-84, across the Columbia River, and into Oregon. Most of the interstate through eastern Washington is through the high desert where it isn’t being irritated, as my father used to say, by those huge sprinkler farms. But less than an hour after I crossed my first state line of the trip, I started climbing again, and when I reached a rest area in the pines at the summit, it was to find an exhibit about how this was the last pass the pioneers on the Oregon Trail had to surmount. It was about twenty degrees cooler than the 90s down in the valley and the view went on pretty much forever. I also saw my first wildflowers of the trip, gaillardia and cow parsnips. My first planned stop of the trip was near the town of Baker City, Oregon, almost all the way to Idaho a couple of hours further on. A lady on my online quilting list had mentioned stopping at the Oregon Trail Interpretive Center, and, history buff that I am it sounded interesting. The center is five miles off the interstate, back in the high desert of far northeastern Oregon, and way up on a hilltop overlooking the valley and the Blue Mountains and, not incidentally, the still-visible wagon tracks from the 1840s, which were quite amazing. The building itself looked new, and the exhibits, says the freelance curator, were top-notch. Entrance to the Oregon Trail Interpretive Center, Baker City, Oregon. One of the exhibits at the Oregon Trail Interpretive Center. Panel pointing out landmarks, including the wagon tracks, second from left, at the Oregon Trail Interpretive Center. I know my western history fairly well, but I still learned things I didn’t know about the Oregon Trail. And I ran across an old friend, so to speak, when I saw a panel on Ezra Meeker, whose mansion is in Puyallup, where I did my internship. Ezra came out to Washington on the Oregon Trail in 1851, and spearheaded the campaign to save and preserve the trail back in 1906-08 by retracing his steps along it all the way to the other Washington, where he met with President Theodore Roosevelt about it. It was getting on in the afternoon by the time I pried myself away from the center, and I only drove one more hour, to Ontario, Oregon, on the Idaho border, crossing over into the Mountain Time Zone in the process. And that was my first day, two weeks ago today!